I got the bright idea of weaving my sister Melinda shawl as a gift. So my creative engine got revving and I'm going with a pattern that is an extension of one I have done before (so I know what I'm getting... but trying something new), using undyed tencel in white or off white ( she is a bride after all!) 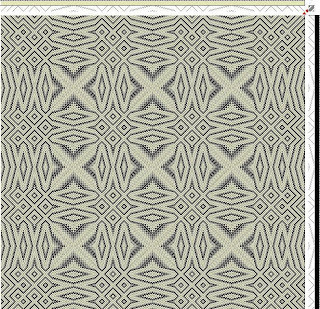 A twelve shaft snowflake twill in 2/10 tencel, sett 28 epi, and 26 inches in the reed. That's 708 ends and since I'm making two shawls, the warp is 8 yards. Its treadled 'as drawn in'. Then I loaded those onto the Louet for winding on. Their warping system a la Jane Stafford is amazing and quite logical. Eight feet or eight yards, it all goes on the same way and is easy peasy! I love the symmetry of the threads all aligned. A thread under tension is a thread under control! Here the ends are corralled into the built in metric raddle. It has 5 slots per inch which means you have to do some figuring. In this case six threads per slot to spread it the required 26 inches. Here's the view from the other side of the loom as I wind on, alternating tugging at the warp and pulling on the brown paper that separates the warp as it winds on. It took me 15 to 20 minutes to wind on the eight yards! Not too shabby. The threading took me a bit longer as I slowly worked my way across the threading draft, marking my spot with mini post it notes to isolate the portion being worked on. Once that was done, I have to sly the reed ( 12 dent: sleyed 2,2,3) A bit tricky with white heddles and white thread. Above you can just see that I have pulled each group and flipped over the top in order for drawing through the reed. Here they are all laying nice and orderly through the reed and working my way across took about an hour and a half. Then my trusty assistant, Hubby, and I lift the loom up onto my 'loom elevators' and now I can sit and work on the tie up. Sure beats crawling underneath the loom. The Louet Spring is light enough for two people to lift. What you see currently on the treadles is my old tie up for the last silk scarves, plus I attached a tie cord to the loose treadles to keep them from flopping around when the loom is lift up. I'll be tying up 12 of the 14 and so that means a grand total of 144 tie up cords between the upper and lower lamms. I thought I'd make a fresh start in the morning and went upstairs to start our dinner. While chopping onions to lay over a salmon fillet, I didn't get my thumb out of the way fast enough and gave myself a good cut. See? See? I 'm not kidding... I stuck the piece back on and bandaged it up! It worked one other time some years ago so maybe twice? So next up is my tie up and I'm going in to try it one handed! This is my tie up sheet. Using my PCW Fiberworks I'm able to print just the tie up on a single sheet and then I use it at the loom. (You can do this with the threading or the treadling too) As I have a countermarche loom I must do a tie up for each and every square on the chart. I'm treating the numbers like X's and tie to the upper lamms (they sink) and the O's are tied to the lower lamms (they rise). Next post I'll continue on the other side of the tie up. Hopefully I'll get faster with the practise! When I got back from Vancouver I took a day to settle in and get my laundry done and then turned my thoughts to the studio again. It was time to bring the black silk project to a close and move onto something new! It's had a lot of obstacles thrown in its way, along with me simply ignoring it for a time but now I had to bring this to a happy ending! First I have twisted the fringes into small groups and you can see how I do this here. In the picture above, I'm hand sewing some bead embellishments to the edges. My full 'how to' on this can be found here. It gave me a chance to browse through my bead boxes and that's always fun. In fact I reorganised the boxes into colour groupings and labeled them. A nice side diversion! I used mainly black seed beads and featured a bronze bead on the silk yak blend scarf. The silk camel blend weft is brighter and has a subtle colour to it. A soft beige cream and so I used a mix of small black seed beads and an irregular beige bead. They were both a bit stiff as some warps can be off loom but they headed straight to the laundry tub to be gently hand washed. Once rinsed and tugged into shape, I hung them outdoors to drip dry. It was such a lovely spring day and it didn't take long before they were just barely damp. I brought them in and gave them a good hard pressing and hung them back up to finish drying. The next morning I have them a final light pressing and then sewed my label on and attached a hang tag. Done!! 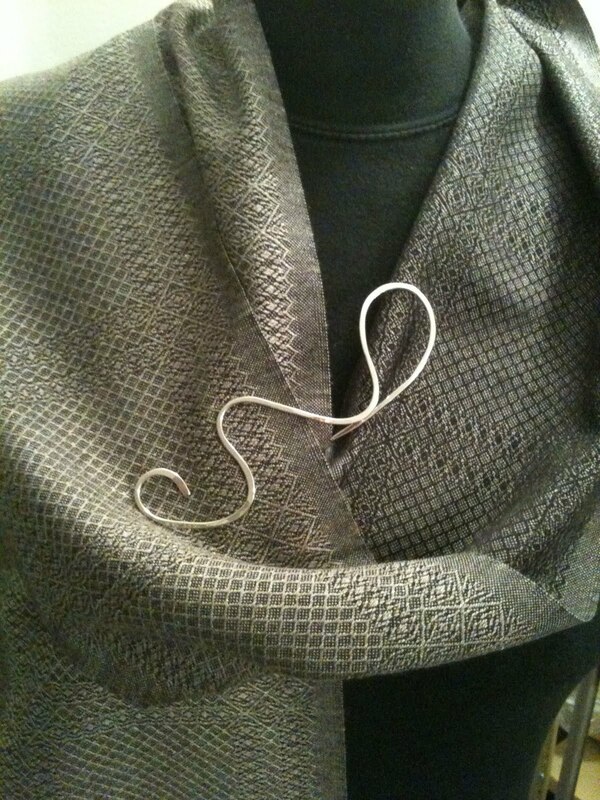 Here's the pressed silk camel blend scarf showing my bead selection. The drape is soft and beautiful! Now these are rather dark coloured scarves for this time of year so I expect they will sit in my inventory till later this fall. Here's the front and back of the silk camel scarf. It is fully reversible and has a 'summer and winter' kind of effect colour wise. You can choose which side suits the occasion! Now I have an empty Louet loom and it just so happens that I have a sister who is planning an exchange of vows later this year. So I have some ideas I'm mulling over to mark the occasion. The stairs were recarpeted while I was away and it sure looks nice. Seems that one small remnant in the warehouse was just enough (barely!) to do the job. Next up is the tile back splash in the kitchen and the tile guy is coming Monday to do the job. Then the kitchen is finally D.O.N.E. Last job of the current interior renovation is to get a new hand rail for the stairwell and we are looking at various wood profiles. The standard ones are too wide and heavy for the space. Mother's Day was a nice one! Not only did I get an orchid I bought for myself but I received a second larger one. Turns out that Dorothy got one almost identical to mine. It hovers over my wee one like an older sibling! Another flower bud has opened since I took this picture and another flower spike is well under way. If you have a reasonable humidity level in your home and a bright spot, but not direct sunlight, then you can grown them in your home too. I want to thank you all for your comments and good wishes on my father's recovery! Unfortunately he's been moved into intensive care after some other problems appeared and now we wait some more. That's the hard part... the waiting! I have been weaving to keep my mind off things and some tricky treadling means I have no room for thinking other than numbers. That's a good thing. Look what I got in the mail the day before I left for Vancouver! Handknit socks. These are a belated birthday gift from my daughter Carrie who lives way over on the other side of the continent in North Carolina. The knitting genes skipped a generation over me and landed with her! She now spins on her Kromski Prelude wheel as well and naturally progressed to dyeing her own fibre. Her fibre Etsy page is here. 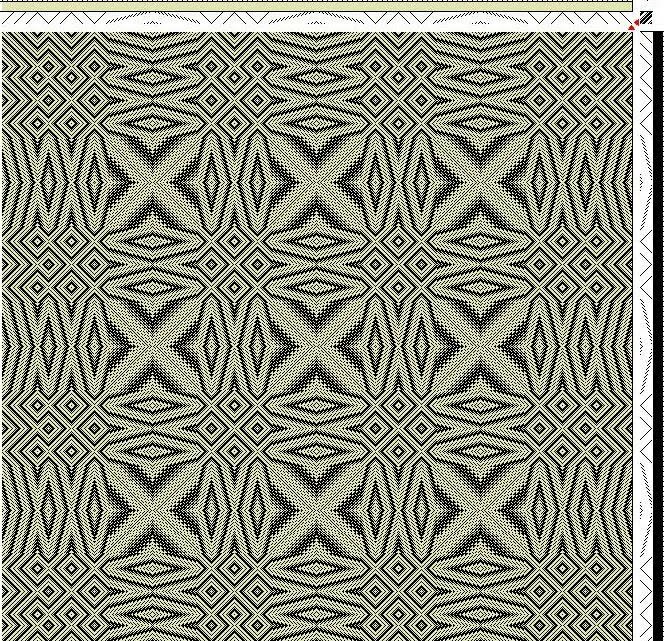 Her Ravelry name is Gnomenapper and her project list is worth a look. Here's a close up shot of the heel. I just love the lavender colour....which she tells me is properly called 'hyacinth' and the yarn is a fine merino wool. The pattern is called 'Ribbon Lace Socks ' and come from Wendy Johnson's book: "Socks from the Toe Up". I have them stretched over my hand in this picture to show the pattern work. These are my husband's birthday socks too. She's been busy! Close up of the heel and the colour 'ash' is darn close to the real thing. Results vary according to your monitor. That's my lumpy hand expanding the sock to show the mock cables. Again, also from Wendy Johnson's book "Socks from the Toe Up". My mother was taught to knit by her father which is a bit different from most other families. He would knit to pass the time during his duty as part of the Home Guard in WW2. During the bombing blitz of London, he and other men who were too old to serve in the military were given the duty of attending the places where bombs hit and securing the scene and rescuing people if possible. Important job when you think of the scale of the bombing and how thin fire fighters were on the ground. Anyhoo, he passed his skills onto my mother who tried (in vain) to show me how to knit at age 16. It seemed that she couldn't slow it down enough for me to get the steps... and my teen age brain didn't like her style of teaching. Let's just say we didn't push it too hard and I went onto embroidery, which I did well... and she didn't. Then I learned to crochet from a neighbour... and she didn't know how and..... Ah, the teen years, a classic adolescent battleground. My mother was a beautiful knitter and did some amazing pieces and I recall her aran knit sweaters clearly. I wish she was still here so we could try once more but she would be so proud of her grand daughter who now carries the torch. Yes, I did try to show Carrie how to weave 'once' and she beat the fell into submission with every whack! I played her Penelope and unwove it by night, then rewove it, and in time the runner came off the loom and was given to a friend of hers as a gift.